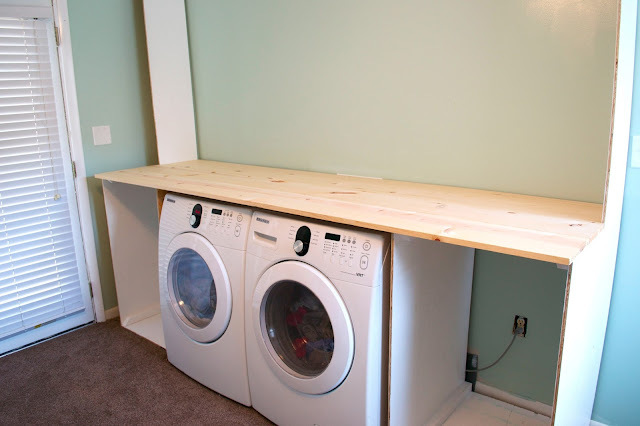 Since we have the baby's room in the same space as the laundry, we wanted to do something so when you walked in, it didn't feel like a laundry room. 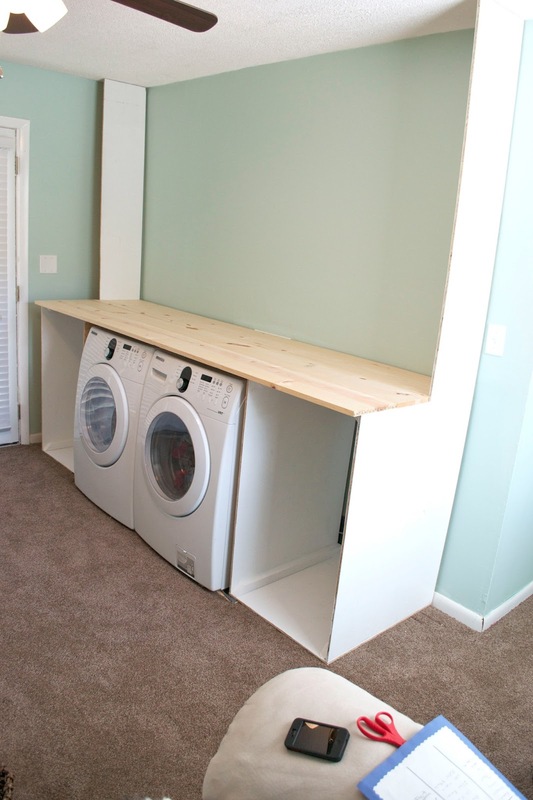 To do this, we decided to build a laundry unit around the washer and dryer. We initially were going to try to buy something for this space but we wanted it to serve so many purposes, that we decided it would be easier to build it so we could get everything we wanted. We picked up three sheets of 1/2" plywood and Nate basically made two U shape structures using the plywood, corner braces and our nail gun. 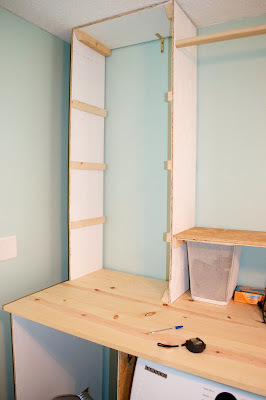 To make everything a little more sturdy, the outside sides of the unit go all the way up to the ceiling which will serve as the sides to the upper storage. To complete the bottom boxes, we used a combo of 1 x 8's and 1 x 10's to create a butcher block counter. We made sure that all sides of the bottom boxes were plum before using the nail gun to attach the top. We decided to not put a back on this unit so the wall color could still be seen and power outlets could still be accessed. Since this took away some structural support of the unit, we attached the whole unit to the wall at the corners so it is very sturdy. At this point, we had our folding space (the counter top) and the beginnings of the sorting space (The bottom units will hold laundry baskets). 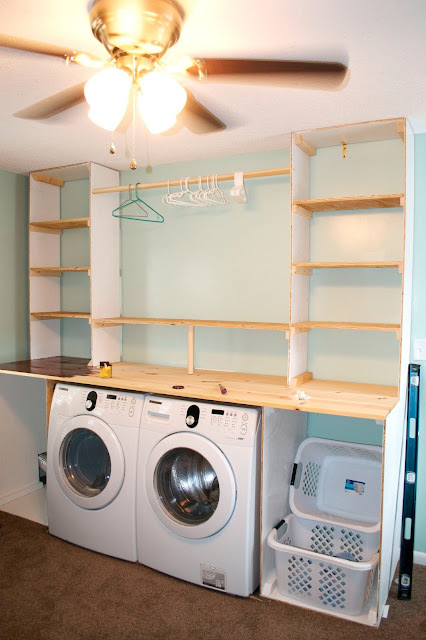 The washer and dryer were becoming less obvious but still had a way to go and we still needed a lot more storage. That's where the top units came into play. Using a similar method as the bottom units, Nate used the plywood with corner braces to create upside down U's with the countertop completing the rectangle. 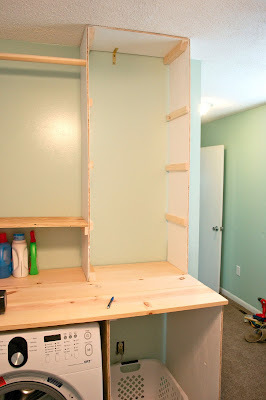 These units got support piece of wood for shelves to be attached (which were made out of 3/4" plywood). You'll also notice that we didn't put the unit all the way against the wall. This is so we could slide the ironing board in over there so it can stay tucked out of the way unless we need it. 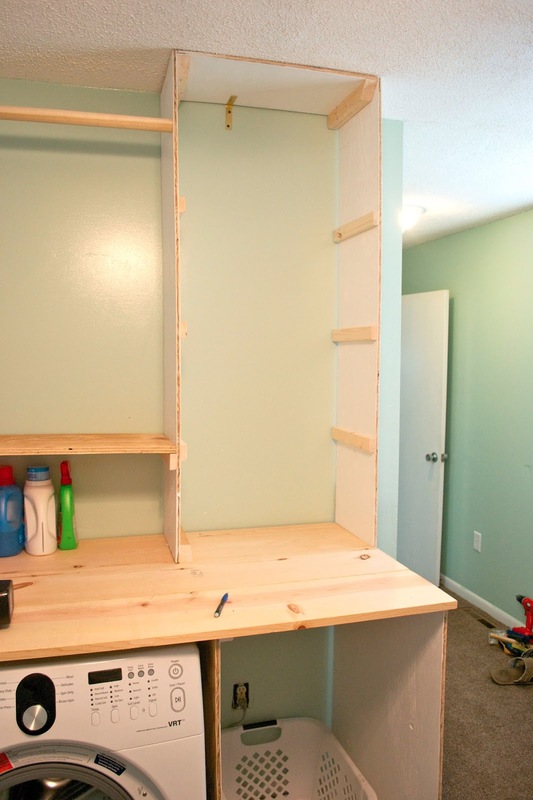 Between the two upper units, we attached a long wooden dowel for hanging shirts and added a long shelf for storing laundry supplies. Since we used plywood, all the edges are a little rough so while you can see the bones of the unit here, there is a lot of trim, stain and paint that needs to be done before we can call it done. We also have to add the supports for the laundry baskets. Since the unit takes up the whole wall, the washer and dryer are no longer the focal point and we are really excited for how much organization space we will have once this is completed! That's a great idea. I've seen the baskets used like drawers, with supports on the sides like slide rails. 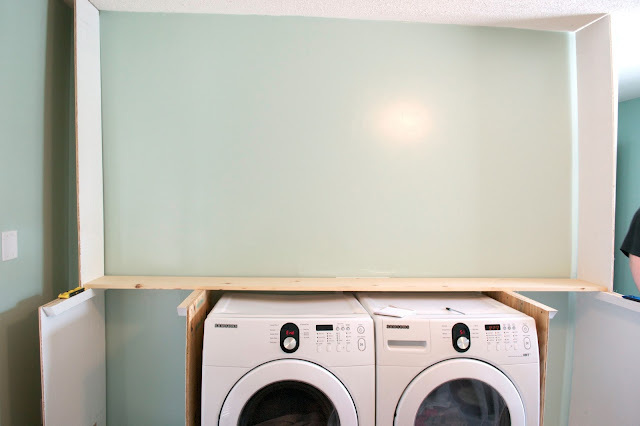 I noticed that the washer dryer units sort of stick out in the front...Is there room for curtain rod mounts that would stick a little further in case, in the future you'd want to put a curtain over the front on the bottom? Just a thought about disguising it... You did such a great job with the french doors in the baby's room, I loved how that turned out. I'm a big supporter of under counter curtains. Do you have a list of materials that you purchased to do this?